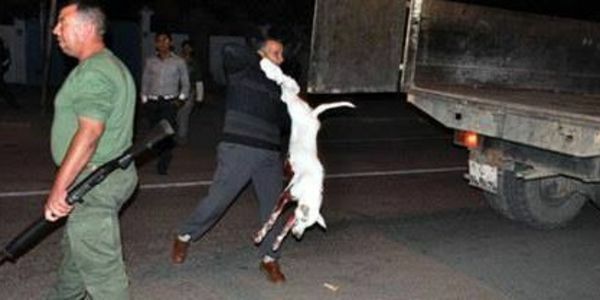 Actually in Morocco (from the beginning of this year 2014 until now 08/06/2014), authorities are shooting and killing stray dogs and cats, old and young, even if they are with their owners. They shoot in front of everybody : men, women, kids, everyone, as if they tell them that "this is the way you should treat animals". After shooting animals, the authorities throw all the animals together even if they are not dead yet, in a pit corpses. We are a muslim country, we don't have to give ourselves the right to kill any living being. If we want to solve a problem we should take our time to think and discuss about it, but killing is the easiest solution which requires no effort. Alternatives exist: "treat case by case, pick up animals if necessary for examinations, and if there are cases of intractable or dangerous diseases, there are milder methods for this, because we do not choose to be an animal or to have a serious disease; we can also sterilize (because animals sterilized become docile and not dangerous except in cases of abuse, and eventually vaccinate animals and sensibilize people to take their precautions " . If we all (authorities, associations, owners, teachers, citizens and others) unified our efforts, we can certainly find other adequate solutions. Finally, we count on your commitment, love, perseverance and willingness to protect this planet and live together in peace.